Over the still image, Ross tells us that his father disapproves of his career path - a career path that involves that moving image camera. I think about the doctor sending his son off to college in the north and then the son returns with a camera - a camera that is, for the most part, pointed directly at the doctor’s face. It is hard to match up values sometimes. It is not an easy day in the south, but it is intimate and complicated and quiet and interesting. All of these good things were established right away in the first moving image scene of the movie. 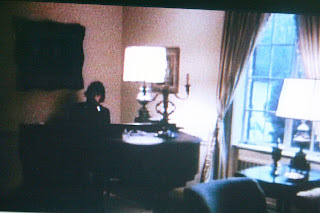 In this scene, Ross films himself, alone, playing the family piano. The piano is out of tune and Ross plays it kind of badly. It is not like he has his tongue sticking while he tries to make an ugly face - it is him trying to be good and failing. It's pleasurable and even strangely soothing to watch him play with sincerity and mistakes and without frustration. It is not an apologetic scene - just one with a lot of information about Ross and maybe of what is to follow. If there is bad behavior or human mistakes caught with his moving picture camera, it will not be too surprising if some of them are his.